August 24, 2017 - St. Vincent Center, the new training facility for the Indiana Pacers and medical/sports performance facility of St. Vincent, was unveiled Thursday in a ribbon-cutting ceremony. 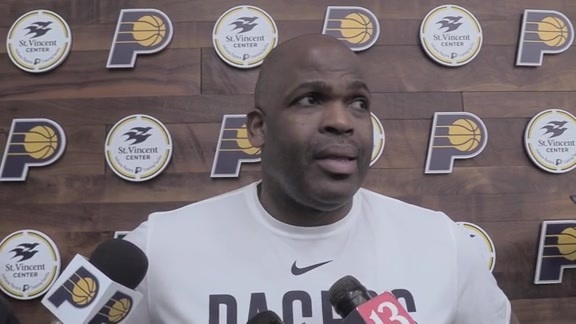 August 24, 2017 - Nate McMillan, Myles Turner, and Kevin Pritchard talk about what sets the St. Vincent Center apart from the rest of the league, the advantages it offers, and how they plan to use the space to improve. Look at back at the 18-month construction of St. Vincent Center, the new training facility for the Indiana Pacers and medical/sports performance facility of St. Vincent. August 24, 2017 - Pacers Sports & Entertainment Owner Herb Simon and his daughter, Rachel Simon, discuss the impact that they hope the newly opened St. Vincent Center will have on the Indiana Pacers and the Hoosier community as a whole. August 24, 2017 - Pacers legend George McGinnis talks about his first impressions of the St. Vincent Center. August 24, 2017 - Jonathan S. Nalli, the CEO of St. Vincent, talks about what the opening of the St. Vincent Center means for the community. August 24, 2017 - Pacers Sports & Entertainment President Rick Fuson talks about the impact that the St. Vincent Center will have on the community and the team effort it took to complete the project. August 24, 2017 - Pacers legends Donnie Walsh and Bobby 'Slick' Leonard talk about the honor of having courts named after them at the brand new St. Vincent Center. INDIANAPOLIS – St. Vincent Center, the new training facility for the Indiana Pacers and medical/sports performance facility of St. Vincent, was unveiled Thursday in a ribbon-cutting ceremony featuring Indiana Governor Eric Holcomb, Indianapolis Mayor Joe Hogsett and officials from Pacers Sports & Entertainment and St. Vincent. During the ceremony, it also was announced that St. Vincent is now the Exclusive Health Care Provider of the Pacers. St. Vincent is a member of Ascension, the nation's largest Catholic and not-for-profit health system. The five-story, 130,000-square-foot facility took 18 months to build. It includes two NBA regulation courts, weight room, training room, other amenities and all offices for Pacers basketball staff. The facility will also include dedicated floors where St. Vincent will provide primary care, cardiovascular, and sports performance services for athletes and the general public. "This is a monumental day for our franchise and underscores my family's commitment to the city and the franchise," said Pacers Sports & Entertainment owner and CEO Herbert Simon. "Competing at the highest level of basketball means we must provide a training facility that can help these elite athletes prepare to perform at their optimum level. And we are overjoyed to have such a wonderful and equally committed partner in St. Vincent." "Thanks to our committed partners and this convenient location in the heart of downtown, the St. Vincent Center will serve as a dynamic healthcare access point for the City of Indianapolis, the Pacers and patients in our community who want high quality, compassionate care from top-tier primary care physicians, cardiologists and sports performance experts," said St. Vincent Chief Executive Officer Jonathan Nalli. St. Vincent Center is located at 201 South Delaware Street, directly across from Bankers Life Fieldhouse. The two facilities are connected via a tunnel. St. Vincent Center is the 20th stand-alone training facility built by an NBA team since 1999. The two Pacers practice floors recognize franchise stalwarts. One is named in honor of the Pacers' Hall of Fame former coach and current broadcaster Bobby "Slick" Leonard. The other honors former general manager and Pacers president and CEO Donnie Walsh, who continues as a basketball consultant to the team. The street-level exterior of the building features basketballs recognizing significant achievements and players in the history of the Pacers and the WNBA Indiana Fever. Meanwhile the rooftop features the inclusion of green space with a fully functioning, 8,500-square-foot garden with 3,200 square feet devoted to vegetable plants, wildflowers and plants indigenous to Indiana. Harvested vegetables with be will be used both in house with Levy Catering and donated to Second Helpings. Primary care – St. Vincent Primary Care physicians will provide clinical expertise with a compassionate, patient-centered approach focused on healing the total mind, body and spirit. Cardiology – Nationally acclaimed physicians and clinicians from the St. Vincent Heart Center, a recognized leader in pioneering cardiovascular research and the home of the largest heart care system in the state, with heart and vascular patient outcomes better than national averages. Sports Performance – Sports medicine physicians, strength and conditioning specialists, athletic trainers, dietitians, psychologists and sports scientists with St. Vincent Sports Performance, the largest hospital-based program of its kind in the country that provides comprehensive care to professional teams, athletes and champions across the full spectrum of the sports world. The St. Vincent Center is also hosting an Open House for the community on Friday, August 25 from 11 a.m. to 1:30 p.m. where the general public will have the opportunity to tour the Primary Care, Cardiology and Sports Performance features on the top two floors of the Pacers training facility and meet the doctors who will practice there. Attendees will be provided with free lunch and a chance to win an autographed Pacers item. To learn more and schedule an appointment at the St. Vincent Center, visit www.stvincent.org/downtown or call 317-469-1919 (Primary Care/Cardiovascular services) or 317-415-5747 (Sports Performance). Continuation of the St. Vincent logo on Pacers practice jerseys. Bankers Life Fieldhouse balcony pavilion naming rights including a new family pavilion. St. Vincent will become the presenting sponsor of Fit Like A Pro and Jr. Pacers programs. A Peyton Manning Children’s Hospital Teddy Bear Exchange pregame in which Pacer players will give teddy bears to area youth. "This is so much more than just a building for our team and St. Vincent," said PS&E President and COO Rick Fuson. "This is a commitment to our community, to our youth, and to the vitality and well-being of our citizens." The current TCU Practice Court in Bankers Life Fieldhouse will continue as the practice facility of the WNBA Fever, but that space – under significant demand for other events – now will be free to be utilized in a much more comprehensive and versatile manner.